Redefine luxury in your own way with a stay at the Clarion The Beach, Goa. The resort offers great facilities filled with endless amenities and fun activities. The guests get refreshed with a new lease of life at the resort. Stun the sun at the resort as one would struggle to find a better place to get oneself tanned while working or rather enjoying life. 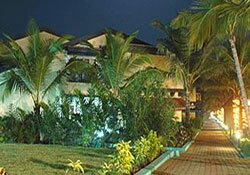 The location of the Clarion The Beach makes it a better Luxury Hotels in Goa. The 5 star property lets you to get recharged and enjoy life again. The business center at the Clarion The Beach, Goa offers great facilities for successful corporate meets and other occasions. For fun and enjoyment the hotel offers the facilities of a swimming pool, stress management workshops, health club, yoga / meditation sessions and a massage room. Other attractions also include the exciting water sports and sight seeing. Stun the sun and embark on a journey that is called life! Goa offers the best of holidaying for the fun seekers with its innumerable ingredients that makes the environment perfectly an enjoyable one. The place is also famed for the innumerable attractions around the state.